Architects, artists, filmmakers and fiction writers have long been inspired to imagine cities of the future, but their speculative visions tend to be seen very differently from scientific predictions: flights of fancy on the one hand versus practical reasoning on the other. Challenging this opposition, Future Cities teases out the links between speculation and practice, exploring a breathtaking range of imagined cities – submerged, floating, flying, vertical, underground, ruined and salvaged. In the Netherlands, prototype floating cities are already being built; Dubai’s recent skyscrapers resemble those of science-fiction cities of the past; while makeshift settlements built by the urban poor in the developing world are already like the dystopian cities of cyberpunk. Bringing together architecture, fiction, film and art, the book re-connects the imaginary city with the real – proposing a future for humanity that is already grounded in the present and in creative practices of many kinds. The launch will feature a panel including myself, publisher Vivian Constantinopolous, and writer Darran Anderson. The discussion will be chaired by Peg Rawes (The Bartlett School of Architecture, UCL) and will be followed by a reception. This is a free, non-ticketed event, so please come early if you want to be guaranteed a seat! See the event’s Facebook page, or UCL Urban Lab’s listing for more details. I’ll be speaking on Senate House and the imagination at this event, along with Bradley L. Garrett, Katia Pizzi, Hilary Geoghegan, Henry Irving and Claire Launchbury. Charles Holden’s Senate House is best known as home to the WWII Ministry of Information and an inspiration behind George Orwell’s 1984. While many Londoners know its imposing form, few realise that beneath the building lies a network of switch rooms, utility tunnels, and hidden spaces. 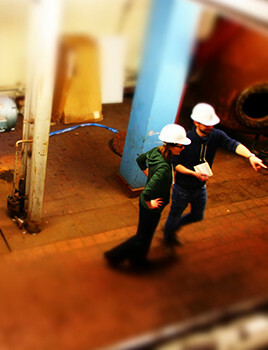 For one night only, join us in the building’s disused boiler rooms for an evening of talks on ‘urban exploration’. The discussion will feature urban explorer and academic Dr Bradley Garrett, alongside academics from the School of Advanced Study and other UK universities. Wrap up warm, bring a torch, and come ready to join the debate! Limited places. Booking essential. Late Tuesday event: Good Taste/Bad Taste? I’ll be speaking on Victorian taste at this special evening exploring architectural taste. With contributions from Poet in the City, architect/designer Sam Jacob, curator/writer Anne Massey and Guardian critic Oliver Wainwright and more! Taste is how we fit ourselves into the world. 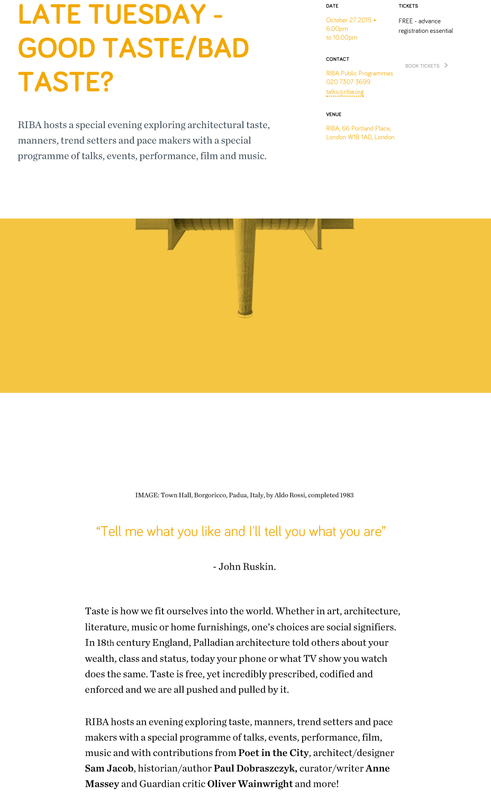 Whether in art, architecture, literature, music or home furnishings, one’s choices are social signifiers. In 18th century England, Palladian architecture told others about your wealth, class and status, today your phone or what TV show you watch does the same. Taste is free, yet incredibly prescribed, codified and enforced and we are all pushed and pulled by it. 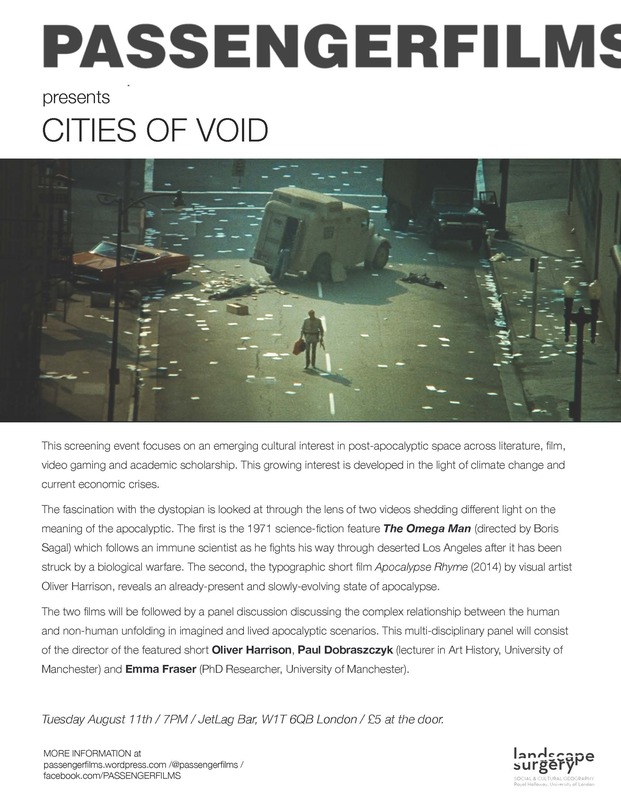 ‘Cities of Void’ event, PassengerfilmsI’ll be speaking as a panellist at this event, which includes a screening of The Omega Man (1971) and Oliver Harrison’s short film Apocalypse Rhyme (2014). This screening event focuses on an emerging cultural interest in post-apocalyptic space across literature, film, video gaming and academic scholarship. This growing interest is developed in the light of ever-increasing sea levels and abundant economic disruptions. The two films will be followed by a panel discussion discussing the complex relationship between the human and non-human unfolding in imagined and lived apocalyptic scenarios. This multi-disciplinary panel will consist of Oliver Harrison, myself and Emma Fraser (PhD Researcher working on imaginations of the end of the city, University of Manchester).